“My baby’s routine had got settled, and I couldn’t be more content. She was feeding and napping on time every day. But all of a sudden, her feeding frequencies and the time that is taken for each feed increased. She was cranky and irritable all the time. I thought that my efforts to put her into a routine had gone down the drain. But 4 days later, she was back to the earlier routine with no signs of crankiness or irritability”. “I used S size diapers for my son. According to his pediatrician, his rate of weight gain was slow but he was a healthy baby. There was a discount sale of diapers on a newly launched online baby products site. So, I confidently ordered almost two cupboards full of disposable diapers sized S. A week later, all of a sudden, he had outgrown the S size diaper!”. Well, Dear Mommies, the above are real-life experiences of mothers who have experienced growth spurts of their babies. The rate of growth of newborn babies in the first year is fast and furious. By the time they turn one year, they would have almost tripled their birth weight. This increase in the height and weight of the baby does not happen in a steady manner throughout the year. Also read: Is Mundan Helpful in hair growth in babies? Growth spurts in babies are a short period of immense growth, which results in a rapid increase in height and weight in the first year of life. During a growth spurt, your baby will put on weight, increase in length and head circumference more quickly than usual. Apart from the physical changes, your baby might also reach a developmental milestone or pick up a new skill during growth spurts. For eg, your child might learn to suddenly roll from back to stomach or may learn to stand up holding furniture. When do growth spurts in babies happen? Growth spurts can happen anytime. However, most pediatricians believe that these spurts are most likely in the first year of the baby, at certain points. How long do the growth spurts in babies last? 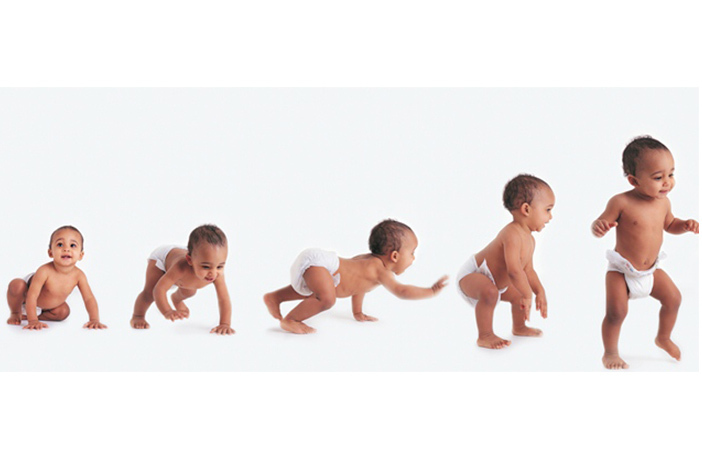 In younger babies, growth spurts last for a day or two, and in older babies, they last for up to a week. Babies do not abide by the clock and the calendar. So the time and duration of the growth spurt of every baby will be different. 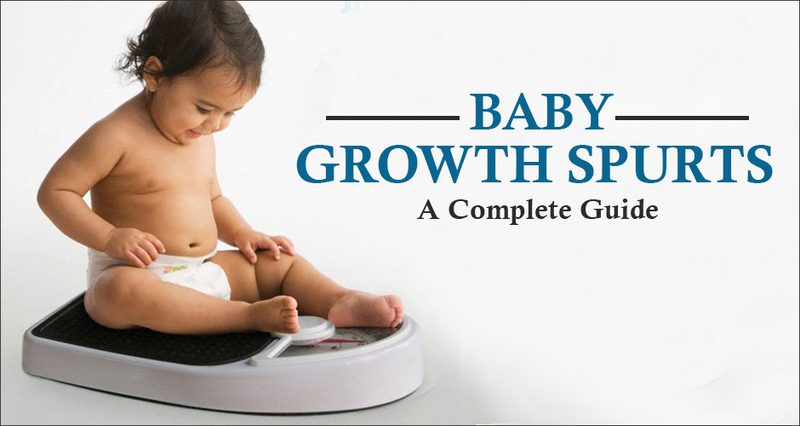 How to identify growth spurt in your baby? You may notice a sudden increase in your baby’s appetite. If you are breastfeeding, her feeding time and frequency would have increased. Typically, their feeding times increase from 8-10 per day to 12-16 per day. Even if you have introduced solids to your baby, her appetite would have increased enough to take more solids during growth spurts. From my own experience, when my daughter was 6 months old, she ate 2 bowls of rice kheer for breakfast. And this was within 2 days of introducing solids. Solution: Allow the baby to take the lead. Feed your baby as much as she wants to. Do not worry about overfeeding. 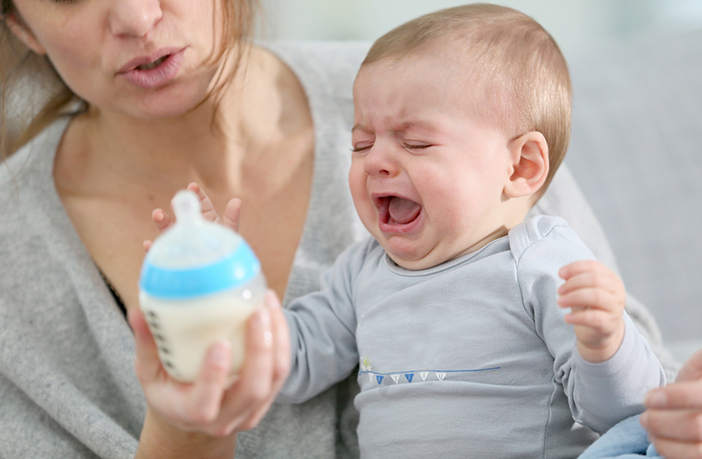 Your baby might be unusually fussy and does not want you to put her down. Your baby might be clinging to you the whole day and doesn’t want to let go of physical contact with you. Some breastfeeding babies are fussier at the breast also and are tough to latch onto the breast and unlatch from it. Solution: Your baby needs extra comforting and soothing during a growth spurt. Offer lot of cuddles and skin to skin contact to reassure and soothe your baby. Your baby needs more sleep than usual during a growth spurt. When the baby sleeps, its brain produces a growth hormone called ‘Human Growth Hormone(HGH)’ which is responsible for the growth. So now, you know the reason for increased growth and increased sleep during a growth spurt. Solution: Allow the baby to sleep as much as she would like to. 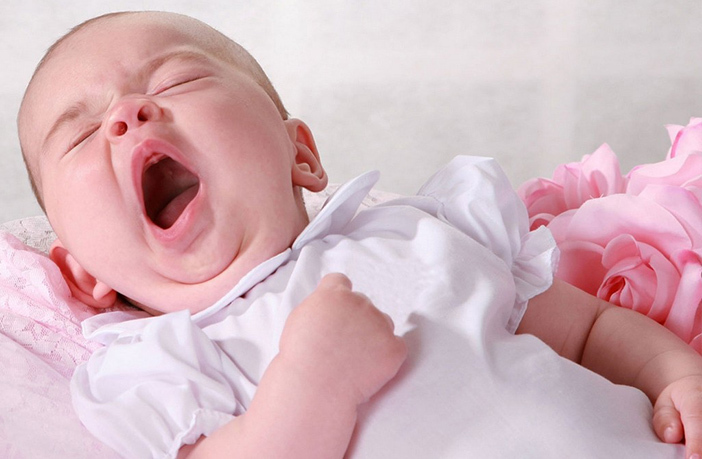 Yes, some babies sleep very less during growth spurts. They wake up more during night times, and the daytime naps become shorter. They want to feed every time they awake from sleep. The main reason for this is their increased appetite makes them hungrier earlier than usual, thus disturbing their sleep. Solution: Take patience and feed whenever your baby wants to and how much ever it wants to. What if my child didn’t exhibit any symptoms of Growth Spurts? Relax. There are many babies who don’t exhibit any of the symptoms mentioned above during a growth spurt. The spurt can be noticed by parents after it has happened. However, you would notice the spurt when the onesies no longer fit your little one, and the little pants you bought a week back are already above the ankle. How to Deal with Growth Spurts in babies? If you are breastfeeding, growth spurts can be exhausting as you have to meet your infant’s additional demand throughout the day. It can make you a lot hungrier and tired as your body copes to replenish the milk supply. Drink plenty of water and eat nutritious food. If you are hungrier than usual, eat to your fill. Your body demands additional food to meet your baby’s demand. Stock up on formula, if you are a formula-feeding. Request for help from your partner or your family members, in managing the household chores or the clingy baby. Do Growth Spurts Hurt the Babies? No, growth spurts are periods of intense growth and in no way it hurt the baby. Your little one may be fussier and hungrier than usual. Also, lack of sleep might cause the baby to be crankier. How different are Wonder Weeks and Feeding Spurts from Growth Spurts? Wonder weeks are like a growth spurt for the brain and has nothing to do with physical growth. This relates to changes in baby’s mental development where the perception of the world suddenly changes and it views the world in a different light. They began to see, observe and understand things which they were never able to comprehend before, in a very short period of time. It’s a time of mental stress for the baby which makes them clingy, fussy or unsettled. Related: Why Breastfed babies have Dark Green Colour Poop (It’s natural)? Feeding spurts are not the same as growth spurts however, they are related. Feeding spurts are times when your baby is hungrier and also feeds longer than usual. Feeding spurt may or may not accompany a growth spurt. During a feeding spurt, your breastfeeding baby may be fussy at the breast. A formula-feeding might be hungrier than usual. Dear Mommies, growth spurts are nothing to be worried about as it is a part of growing up. The insatiable hunger, fussiness, oversleeping etc will subside within few days, and your baby will return to its usual routine. However, keep in mind that growth spurts do not cause extreme irritability, lethargy or fever in infants. Also, check if your baby is getting enough milk if you are breastfeeding. Consult your pediatrician immediately if you notice any abnormal symptoms in your child.